Blinds Leicester, a family run business specialising in manufacturing, supplying and installing quality made to measure internal window Blinds from the comfort of your home or business. Over the last 11 years we have supplied and installed blinds Leicester & Leicestershire, Coventry, Nottingham, Derby, West Midlands & London to sectors including Residential, Commercial, Restaurants, Offices, Universities, governmental organisations and shops, from our main office and blinds manufacturing unit in Leicester. We aim to provide every customer a 5 Star service, you can check our independant blinds reviews on our website, we have partnered with Feefo who check and verify each review, giving you a peace of mind you are in good hands. 1. Clean and clutter free look with ease of operation and low maintenance. 2. Blinds are reliable and adaptable meaning, they last long and there is one to fit most window situations, you just need to take a look at our comprehensive range of blinds. 3. 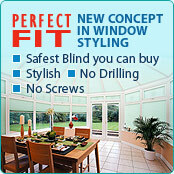 Price, our products continue to be a cost effective way to dress your window with blinds, why not check out our Special Offers Page and see what bargains you can pick up this month! 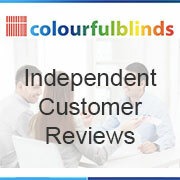 At Colourfulblinds we have spent a great amount of time making sure we give you the best and nothing less than the best. This means taking considerable care in sourcing our blinds components and Fabrics from well-respected UK blinds suppliers, allowing us to maintain quality and keep up with the latest fashion in window blinds systems. As you navigate our company website you will experience the full and up to date range of made to measure blinds products available, manufactured in house at our unit in Leicester. 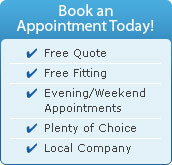 Why not book an appointment by simply calling 0116 316 9866, one of our advisors will then be in touch with you to arrange a suitable day and time for a FREE QUOTATION, we also provide FREE FITTING service from blinds purchased from us. All our advisors are fully trained and insured to provide professional advice for all blinds Leicester and surrounding counties and solutions to your requirements, and for your convenience we can offer a weekday, evening or weekend appointments. If you would like to see some of our work you can go to our gallery, you’ll get some great ideas of what we have done for our customers, if you have an idea let us help you turn it into a blind. We provide Made to Measure service in Leicester, Leicestershire, Melton Mowbray, Loughborough, Coalville, Hinckley, Coventry, Nottingham, Derby, Wolverhampton, Dudley, Sutton Coldfield, Walsall & London.